NeoFinder makes it very simple to manage your licenses. Just visit to the NeoFinder menu, and select License. Then NeoFinder will show this window for you, where you can see what your current license status is. 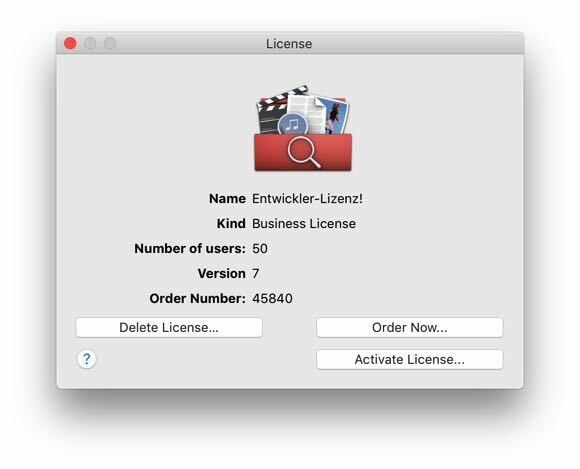 In this case, it is a Business License for 50 users, and NeoFinder version 7. To deactivate that license, for example when you sell that Mac, use the Delete License button. If you use a demo or temporary license, or if you wish to expand your number of users, use Order Now. After you have purchased a NeoFinder license, we will send you a license file by email. If you have received one, please use Activate License to load and activate that license file. This license file has a name like 12345.neofinderlicense. Please do not rename it, as that name suffix is needed so that NeoFinder can identify the file kind. Normally, you would simply double click that file in the mail you have received. Mac OS X will then launch NeoFinder and activate the file for you. Alternatively, you can save the file, and then use the Activate License command to select and activate it. Also, it is a good idea to safely store a copy of that license file, in case you later need to re-install it, or in case your hard disk has to be replaced, or something like that. There is no need to download another version of the NeoFinder software itself, because your license key will unlock the demo version for you. If you wish to expand or update your license, you don't need to deactivate the old one, just simply activate the new one and you are done. This is really simple, right? NeoFinder stores a copy of the activated ".neofinderlicense" file in the NeoFinder folder in the Application Support folder of the active user. If you use any software distribution and management tool, you can simply place the file there. It must be named "Active.neofinderlicense" to be found by NeoFinder. If you buy a multi-user Business License, you will get one single NeoFinder license file that is good for as many installations as is indicated in the number of users of the license. I still haven't received my license key, what is going on? To get around this, either send us a different email address we could use. I have only received a temporary license key? When you purchase a NeoFinder license using your reseller Kagi, you receive an email with a confirmation of your order. As a service for you, this email already contains a temporary NeoFinder license key, so you can start using NeoFinder immediately. You will receive your own permanent license key in the five business days following that purchase directly from us, in a second email. Please make sure that you did not block the "wfs-apps.de" and "cdfinder.de" domain in your mail server, see above! I have purchased NeoFinder with PayPal, when will I get my license key? After the successful PayPal transaction, you will see a web page telling you that we will deliver your license key by email within five business days. That page also includes a temporary license key that will get you started immediately. NeoFinder is of European Union origin and is subject to the European Union export laws and regulations. All versions of NeoFinder (or previously CDFinder) are unclassified and qualify for export license exception according to the General Software Note (GSN) in Annex I to Council Regulation (EC) No 428/2009. Therefore, no license for either export or selling the product is required. Your local authorities may have other additional export control regulations. For instance, ECCN according to US BIS would be 5D992. Our products are generally available to the public by being sold, without restriction, from stock at retail selling points (software resellers) by means of electronic transactions. All versions of NeoFinder are designed for installation by the user without further substantial support by the supplier. NeoFinder uses SSL encryption for authentication purposes only. German Federal Office of Economics and Export Control (Bundesamt für Wirtschaft und Ausfuhrkontrolle - BAFA). Export controls on dual-use goods in EU. Council Regulation (EC) No 428/2009.